I've had this cactus for 5 years. There's another one on the left side of the mantel too. Its blooms are white and not nearly as striking as this vibrant pink. I love them dearly and am glad they continue to thrive. They give me a reminder of my hours of volunteer work in the green house in college. 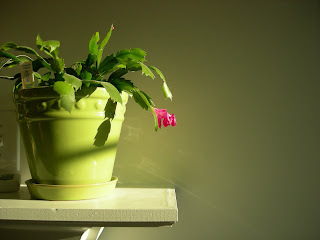 I loved to see the varied plants and enjoyed watching the cactus produce these soft delicate blooms. Desert plants are one beautiful thing.